Clouds - How much does a cloud weigh? The clouds overhead are made of water, of course. Most of the clouds you see in the atmosphere are composed of tiny droplets of liquid water, but not all. Very high in the sky the air gets really cold, way below freezing. Clouds in this region are made of ice particles. You see ice clouds all the time as cirrus clouds. They are usually rushing by as if they are late for dinner, but that is only because the winds at high altitudes are often moving very fast. 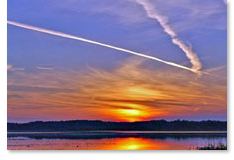 Actually, some of the cirrus clouds you see are created by humans—these are the "contrails", or condensation trails made by airplanes, as you see in this picture. When rain falls where you live, much of it disappears from evaporation, right? But what about at the top of Mt. Everest? The elevation is over 29,000 feet and temperatures at the peak are never above freezing, so it never rains there. It does snow a lot. We all know that snow melts, but if it never rises above freezing, how does snow not build up forever on Mt. Everest? 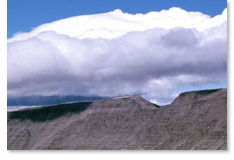 As this picture shows, winds, often at hurricane force, blow tons of snow off the peak. But a part of the water cycle called "sublimation" is also at work. Just as evaporation turns liquid water into water vapor gas, sublimation turns frozen water directly into water vapor gas, skipping the melting phase into a liquid. Also, as with evaporation, the sun's heat causes sublimation to work, and on top of Mt. 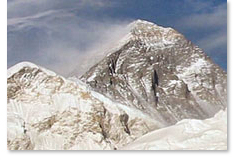 Everest on a clear day, the sun is very strong and provides energy for sublimation, even though it is below freezing. Sublimation doesn't just occur on mountain peaks. If there is snow and ice buildup in your neighborhood then on a sunny and dry day sublimation is happening there, too. Clouds are made of water, and water has weight, so how can they float? They float because the air below them has weight, too-more weight. Think about oil and water—if you pour oil into water the oil floats to the top of the water. That is because oil is lighter (less dense) than water; the same thing applies to clouds in the sky. What fools you is that the water vapor in the air in a clear, blue sky is invisible, and there is not enough water vapor to condense into clouds. Water vapor contains water molecules-one oxygen atom and two hydrogen atoms. You know hydrogen is the lightest of all elements, and, even when combined with an oxygen atom, the hydrogen acts like little "hot air balloons" that makes the vapor lighter than the molecules in the surrounding dry air. 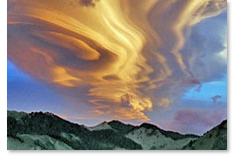 Water vapor naturally floats upwards, eventually condensing and forming clouds. And, a cloud weighs... According to NOAA, your average cumulus cloud one kilometer (0.62 miles) on a side will weigh about 998 million kilograms (2.2 billion pounds). That is equal to about 22 million (22,000,000) kids weighing 100 pounds each. Ice and glaciers are part of the water cycle, even though the water in them moves very slowly. 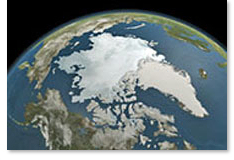 The amount of ice on the Earth goes up and down as the world's climate cools and warms over thousands of years. Lucky for us we're now in a warmer phase of the Earth's history, but the last Ice Age was only 18,000 years ago. At that time, ice covered the northern part of North America. So much liquid water was locked up in ice back then that the oceans were about 400 feet (122 meters) lower than they are today. If all land ice melted today the seas would rise about 230 feet (70 meters). Ice and glaciers are still very prevalent today, as you can see by looking at a satellite image of Greenland (now, why is it called "Green"land?). Glacial ice covers 10-11 percent of all land. In fact, most of the world's freshwater, about 68 percent, is locked up in ice, snow, and glaciers. Ice caps influence the weather, too. The color white reflects sunlight (heat) more than darker colors, and as ice is so white, sunlight is reflected back out to the sky, which helps to create weather patterns. The air is full of water, even if you can't see it. Higher in the sky where it is colder than at the land surface, invisible water vapor condenses into tiny liquid water droplets—clouds. When the cloud droplets combine to form heavier cloud drops which can no longer "float" in the surrounding air, it can start to rain, snow, and hail... all forms of precipitation. The amount of precipitation that falls is different all around the world. In deserts, such as in Chile, it may only rain one inch per year, while on some mountains in Hawaii and in India, it can rain more than 600 inches per year. That is almost 2 inches every day! Some locations get rain all year long, and many other places have rainy and dry seasons, and only get significant rainfall during certain months of the year. Some places, such as Antarctica, really don't get rain, but they sure get a lot of snow, which accumulates as icefields and glaciers. Precipitation is the "exit ramp" back to earth from the superhighway in the atmosphere that is moving water vapor and clouds all around the globe. The atmosphere truly is the superhighway in the sky that moves water everywhere over the Earth. The next time you go outside you will be standing in the Earth's atmosphere. The atmosphere is all the air from the bottom of an ant's leg up to where there is no more air—many miles in the sky. The air outside may look invisible, but it is full of molecules, including water molecules, as water vapor. That big cumulus cloud (full of water) floating in the sky is the water cycle in action. The water vapor all around you rises up into the sky to become part of a cloud which will float off with the winds, probably looking for a picnic to rain on. A cloud in the atmosphere can move for hundreds of miles before it releases its water as rain or snow. That is how water that evaporates from the ocean one day may end up as rainfall over Ezmerelda's tomato patch in Kansas the next day. All air contains water molecules in the form of water vapor, which is invisible. Since the water cycle is all about water changing forms all the time, how does the water vapor turn from a gas back into a liquid and become rain? The word is "condensation". Water vapor gas condenses back into liquid water and ice, which you mainly see as clouds and then as rain and snow. Condensation happens because of temperature changes. Warmer air can contain more water vapor than colder air, so when air rises up from the heated earth's surface high into the sky (warm air rises, of course), to where the temperatures are much colder, condensation happens. Some of the water vapor in the cold air high in the sky just cannot stay a gas, and condenses into tiny liquid water droplets—the clouds you see every day. Give it time, the liquid water comes down as rain. Volcanoes cannot exactly get angry, but as this picture of Mt. 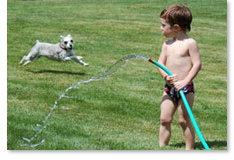 St. Helens, USA in 2005 shows, they really do "blow off steam". It may not be a big component of the world's water cycle, but volcanoes and geysers do release steam into the air, steam which rises and becomes clouds. 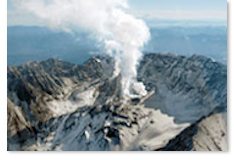 What is interesting about the steam coming from a volcano is that the components of water are coming out from deep inside the earth, which is on the far edges of the water cycle. At a certain depth below the land surface you won't find liquid water, due to the tremendous temperatures and pressures. But the molten rock and material making up magma deep in the earth contains chemicals that later do form water molecules. When it rains, the rivers rise, right? But what about when it snows—what happens then? Yes, the rivers still rise, but it may not happen until 6 months after it has snowed. If it is cold, precipitation will often fall as snow rather than as rain. If it stays cold, the snow could build up all winter and not begin to melt until spring. That snow is temporarily locked up "in storage" as ice and snow in the land alongside the river. Just like the flowers waiting for springtime to bloom, this snow is waiting for warmer temperatures so it can melt and get back into contributing water to the ever-moving water cycle. In many regions, when large-scale snowmelt happens in the spring, watch out downstream, because significant flooding can occur from the melting of months of accumulated snowpack. This picture shows Bow River falls in Banff, Canada during the springtime melting period. Notice the blue-green color of the water. This is common for meltwater from a glacier, in this case, often due to the suspension of very fine minerals in the water. Runoff is nothing more than water "running off" the land surface. Just as the water you wash your car with runs off down the driveway as you work, the rain that Mother Nature covers the landscape with runs off downhill, too (due to gravity). Even though some rainfall soaks into the ground, most of it flows over the land surface, going downhill. This runoff water reaches rivers, lakes, and the oceans, keeping the water cycle going. Runoff is also important because as it flows over the land, some of it soaks into the ground, thus "recharging" groundwater, providing plants with water for their roots to take up so they can create the delicious beets and spinach you like so much, and keeps underground aquifers (areas underground full of water) full so people can drill a well and pull the water out for their own purposes. Some of the water that falls from the sky soaks into the ground and becomes groundwater, while some rainfall evaporates back into the sky. Most rainfall stays on the land surface and, due to gravity, starts running downhill. The runoff water will accumulate in creeks, streams, and rivers. 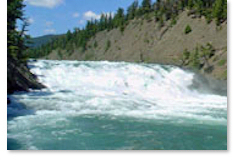 Rivers are responsible for moving a lot of water off of the land and eventually back into the oceans. Something you probably don't know, rivers also lose water through their streambeds into the ground, and water from the ground seeps into rivers, so rivers interact with the ground. Plants, animals, and people interact with rivers, as all kinds of life seems to thrive around rivers and the land alongside them (riparian zones). In fact, if you look at a map of anywhere in the world, you'll see how people naturally build their cities next to rivers. 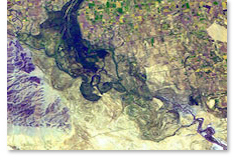 If you look at a satellite view of a dry part of the world, as this picture shows, you can often pick out the rivers because of the green growth growing along them. Fog contains very tiny liquid water particles, like a cloud, and floats, like a cloud. Actually, fog IS a cloud, but one that swirls around your feet instead of high in the sky. Fog forms when air containing invisible water vapor encounters cooler temperatures (next to the ground) and some of the water vapor condenses out into liquid water droplets. In this picture, as the day warms the air next to the ground will warm, too, and the fog particles will again evaporate back into invisible water vapor. In the case of dew, water vapor in the air encounters a substance that has become cooler, such as the grass at night or even your glass of iced tea. The cooler temperatures causes the water vapor in the air to condense into liquid water—dew. 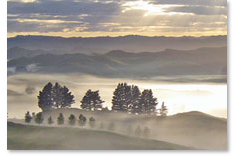 Fog and dew can join forces to become an intricate part on the water cycle in certain locations. On the island of Maui in the Hawaiian Islands, fog condenses into dew and drips onto the ground, contributing a significant amount of water to the forests during the non-rainy months. In the grand scheme of the water cycle, animals may not play a very big role, but all animals, including you, participate in moving water around as part of the water cycle. The water cycle is critical to all animals and life on Earth. All animals need to take in water, use it, and get rid of the excess—animals have their own mini-water cycle going all the time. 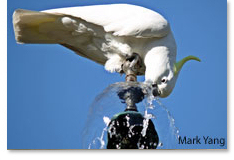 And some, like this parrot, have even learned to use a park drinking fountain when they need a drink. There is one creature on Earth that does have a very large impact on the water cycle—human beings. The natural water cycle changed once people came on the scene. People have adapted and remade parts of the world to make use of water, such as draining wetlands, pulling massive amounts of water out of the ground, damming rivers to create reservoirs, and using significant amounts of water from rivers for human use. You may know that water's chemical composition is H2O. A water molecule contains 2 hydrogen (H) atoms and 1 oxygen (O) atom. One molecule of water in your glass won't quench your thirst, though. You need LOTS of water molecules, trillions of them. At normal temperatures all those individual water molecules like to stick together and form a liquid (the water in your glass). Because of the way that the hydrogen and oxygen atoms exist in a water molecule, one water molecule is attracted to another water molecule. The opposite sides of a water molecule stick to each other just as opposite sides (poles) of magnets do. Like a magnet, one side of the water molecule (the side with the oxygen atom) has a negative electrical charge while the other side, where the hydrogen atoms sit, has a positive charge. Since opposite charges attract each other, water molecules attract each other. So much so that when trillions of them get together, they often start sticking to each other and, thus, you have liquid water. Streamflow is the water flowing in the creeks, streams, and rivers that you see in the low-lying parts of the landscape. After the rain falls, most of it runs off the land downhill, towards rivers and the oceans. One word can explain why any river exists on Earth—gravity. You've heard that "water seeks its own level," but really water is seeking the center of the Earth, just like everything else. So, no matter where on Earth water is, it tries to flow downhill. With the Earth being a very unlevel place, water collects in rivers, which are the highways for precipitation to eventually get back to the oceans. A watershed is the area of land where all of the precipitation that falls in it drains off and goes to the same point in a river. Think of a big footprint, pointing downhill, in the mud on a steep hillside. Whatever water falls onto the area of the footprint will flow down to the toe and maybe flow out (as a "river"). The whole footprint is the "watershed" for the point where water leaves the footprint. You know all about seepage. 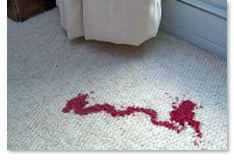 When you spill your red fruit drink onto your Mom's white carpet, she rushes (after glaring at you) to get a sponge to soak up the liquid before it "seeps down into the carpet". Seepage is a natural process with water that occurs everywhere, too. Seepage occurs when precipitation falls on the landscape and starts to soak into the ground. The "Why?" this happens is simply gravity. Read our sections about groundwater and you'll find out that there is a whole lot of water in the ground below your feet, water that is always moving, too. The process of water seeping into the ground is called infiltration. But, seepage doesn't just happen downward. Water flows sideways, too, from the ground into the bottom of rivers, lakes, and the oceans. Some of the water you see flowing in a river has come up from the ground. A spring is a place where water moving underground finds an opening to the land surface and emerges, sometimes as just a trickle, maybe only after a rain, and sometimes in a continuous flow. 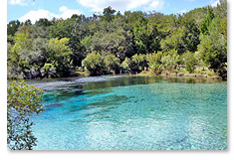 Here is a pleasant spring used as a swimming hole in Florida, USA. The crystal-clear water (groundwater is often very clear, as the ground filters out particles) is a constant 73°F (23° C). Some parts of the world have a lot more springs than other places, since the flow of water underground is largely dependent on what kinds of rocks are underground. In a place like Florida that has a lot of very porous rock full of cracks, water can more easily move around, as opposed to ground containing more solid and less-cracked rock. Thus, in Florida, you find a relatively large number of springs. 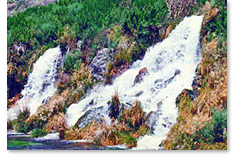 Hot springs occur where the groundwater is heated by the hotter temperatures deep in the ground. The famous Old Faithful geyser in Yellowstone Park, Wyoming, USA is really a spring. A geyser is just a spring that releases built-up water at intervals. And there are even hot springs (ocean vents) at the bottom of the deepest points of the Pacific Ocean, and in Greenland. Take a breath and breathe out—you just participated in the global water cycle. Your breath contains water—breathe on a glass pane to see it appear. When a person breathes, the term is called "respiration". All the plants around you are "breathing" and releasing water, too. The term is called "transpiration", and although a Brussels sprout doesn't have a mouth, it has tiny holes in its leaves that allow water to leave the leaf, via evaporation, and go into the air. So, plants "transpire" water while humans "respire" water. 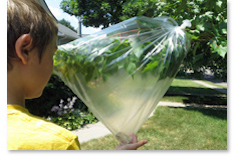 A large tree can transpire many thousands of gallons during the growing season. But the big word is "Evapotranspiration", which is just a combination of "evaporation" plus "transpiration". This just means that not only are plants transpiring water from their leaves, water is evaporating from the soil all around them, too. 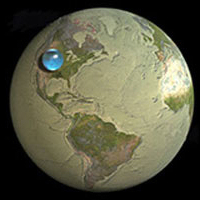 If you look at this picture you see that "tiny" blue ball sitting in the middle of the United States—if all the water on, in, and above the Earth was collected in one big ball, this is the size it would be. The oceans are, by far, the largest reservoir of water on earth—over 96% of all of Earth's water exists in the oceans. The big ball here is about 860 miles (1,384 kilometers) across (diameter). In terms of the water cycle, almost all water that is in the atmosphere (about 90%) comes from evaporation from the oceans. Not only do the oceans provide evaporated water to the water cycle, they also allow water to move all around the globe. 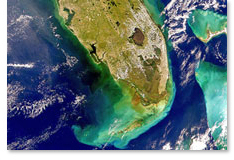 Ocean currents move massive amounts of water throughout the oceans, and the movement of water affects everything from the climate to the environments where life thrives both in the oceans and on the continents. The Gulf Stream in the Atlantic Ocean, for example, moves warmer water from the Gulf of Mexico northward and eastward, ending up on the coasts of northern Europe. Much of Europe would be much colder if it was not for the Gulf Stream. 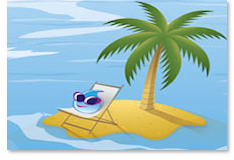 If this drip sitting on a desert island is hoping to get a tan, she'd better hurry because the water cycle is not going to let her hang around here very long. A water drop laying in the sun on a hot day is just asking to be evaporated by the sun. As soon as she sat down in her chair, the sun's heat began to evaporate her into water vapor gas, and so she will float off as millions of vapor particles up into the sky. The drip won't be upset, though, as her water vapor will eventually recombine to form clouds and then rain which will runoff the land into rivers which flow into the oceans, again. She can be back sunbathing by the next day. You can't see it, but a large portion of the world's freshwater lies underground. It may all start as precipitation, but through infiltration and seepage, water soaks into the ground in vast amounts. Water in the ground keeps all plant life alive and serves peoples' needs, too. How much rainfall infiltrates the ground depends on many things and varies a lot all over the world. But infiltration works everywhere, and pretty much anywhere in the world you are, there is some water at some depth below your feet, courtesy of infiltration. Infiltration recharges groundwater: Just like a rechargeable battery, aquifers in the ground are "recharged" by water infiltrating from the surface. And because water underground often flows sideways, water in the ground can be recharged by rainfall hundreds of miles away. 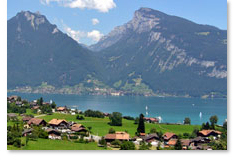 Here is a pleasant scene of a lake in Switzerland. A lake is a low area on the ground where water collects and pools. Water is coming into the area faster than it leaves, so it backs up, forming a lake (people cause this too by building a dam on a river, creating a reservoir). 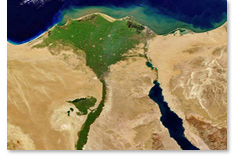 Lakes are surrounded by higher land on some sides of it. 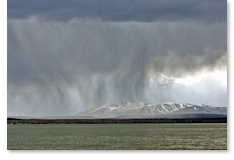 Rain that falls and snow that melts on the higher land alongside a lake (the watershed) flows down the hills as runoff into the lake. Water also seeps into the ground alongside the lake and flows downhill (though underground) contributing water to the lake. A lot of water coming into a lake arrives from creeks and rivers that flow into it. These creeks and rivers collect and move water flowing downhill in the watershed that drains into the lake. Thus, a lake's level will often rise when it rains many miles upstream from it in the watershed. Every tree, grass blade, and plant around you is performing a gravity-defying wonder: it is moving water, against the force of gravity, upwards from the ground into its roots, trunk, branches, and leaves (where it finally exits via transpiration). Plants mostly depend on water in the ground for their needs, not rainfall directly. Even when you sprinkle your garden with water to give it a drink, the plants want the water that soaks into the ground next to them, not from the water that lands on their leaves. 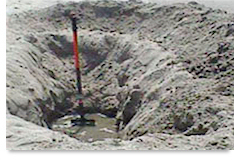 In the ground, rain infiltrates downward into the ground, with much of it being held in tiny spaces between the dirt particles close to the surface. 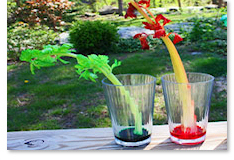 This is the same zone that plants put down their roots, roots that pull in the groundwater and send it up, via capillary action, to the rest of the plant. If you pour a glass of water onto the ground it usually sinks right in (infiltration), so you can imagine how much water sinks into the ground during a major storm (Find out here). Here in Atlanta, Ga, USA it rains about 50 inches/year. Over a 100 square mile (10 miles by 10 miles) area, that means 87,000 billion gallons of water falls, with much of it soaking into the ground to become groundwater. Yes, water below your feet is moving all the time, but, no, if you have heard there are rivers flowing below ground, that is not true. Water underground moves, due to gravity, downward and sideways. Groundwater serves many purposes in nature: keeping plants alive, filling aquifers, from which people can withdraw water, providing water to rivers and lakes, and eventually flowing into the oceans. The ground stores huge amounts of water and it exists to some degree no matter where on Earth you are. The water gets there by gravity. The top layer of the ground is the soil and below that is where true groundwater exists—sometimes called an aquifer. In these layers the rock has many small openings, cracks, and fissures and water occupies all the spaces. People can sometimes drill wells into this region and pull out water for irrigation and drinking. This picture gives you an idea of how an aquifer works. At a certain depth water saturates all the openings between the rock (sand, in this case) particles. That pool of water you see is a mix of dirt and water (the "aquifer" you see in this picture is more watery than a true aquifer). The deeper down you go, the rocks become more dense, thus "squeezing" out openings in the rock. Temperatures also get extremely hot further down, which prevents liquid water from existing. Thus, at a certain depth, miles into the Earth, no more liquid water will be found.